A cinema famed as one of the first UK venues to show moving pictures has moved a step closer to reopening. Plans to remodernise and reopen the old Scala cinema in Prestatyn will cost around £2.4m. The Welsh Assembly Government has now stepped in with a cash boost for the project and awarded Denbighshire Council £200,000. The Victorian building closed in 2001 because of structural damage. Locals are keen to redevelop the site to give something back to residents. The money is needed to pull down part of the old white and blue facade to make way for elegant arched windows. A community room, studio for theatre use, visual arts gallery and cafe bar are also included in the scheme for the old Victorian landmark. A 150-seat cinema and a second part-time cinema will also be built. The Scala cinema was originally built as the town hall in 1898 and had its grand opening on 26 July 1900. The first animated pictures were shown there in July 1910 by James "Saronie" Roberts, a film pioneer from Liverpool. Roberts started showing his own films of local scenes, as well as animated pictures of national events such as the funeral of King Edward VII. He converted the hall into a picture house, which opened in 1913. An early colour film was shown in 1915 and the first 'talkies' by 1930. Roberts retired in 1963 when he sold the cinema to the local council. 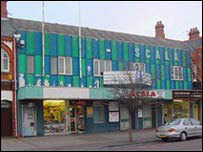 In March 2001, campaign group Friends of the Scala was set up to lobby councillors and get the cinema reopened. 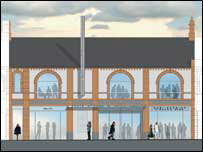 "The council is fully aware of the strong feelings in Prestatyn about the Scala," said local councillor Sue Roberts. "This grant will enable us to move the project a step closer to reality, but much work remains to be done to find the money to build and run the new Scala." It is hoped the revamped Scala will open in around 18 months.